Author(s): Lutfu Hanoglu, Burak Yulug, Department of Neurology University of Istanbul-Medipol, Istanbul, Turkey. Tansel Cakır, Kubra Sogukkanli, Ozge Arıcı Duz, Tamer Atasever. Background: Lamotrigine and topiramate are well-known agents with their antiepileptic and mood stabilizing effects. Their therapeutic effect is associated with significant alteration of brain metabolism. In our study, we aimed to investigate the neurometabolic correlates of the therapeutic effects of both agents in a depressive patient with anxiety symptoms and cognitive decline. Methods: In addition to structural Cranial Magnetic Resonance Imaging, we also have performed Neuropsychometric evaluation and FDG-PET Brain fludeoxyglucose positron emission tomography (F18) (FDG PET-CT) FDG-PET before and after the treatment. Brain fludeoxyglucose positron emission tomography (F18) (FDG PET-CT) images were taken before and after the treatment using Philips Gemini TF PET/CT equipped with 16 slice CT. The raw FDG-PET data was processed using NeuroQ software (Version 3,5. Syntermed, Inc Atlanta. USA). Results: Topiramate and lamotrigine additively reduced the neuropsychiatric symptoms and test scores which were associated with the improvement of cerebral glucose metabolism. Conclusion: Our present findings support that the therapeutic effect of lamotrigine and topiramate involves a modulatory effect on the glucose metabolism in cortico-subcortical network and suggests the functional role of a bi-directional hippocampal-cingulate connectivity. Keywords: Anxiety, cerebral glucose metabolism, cognitive decline, depression, lamotrigine, topiramate. Affiliation:Department of Neurology University of Istanbul-Medipol, Istanbul, Turkey. Keywords:Anxiety, cerebral glucose metabolism, cognitive decline, depression, lamotrigine, topiramate. Abstract:Background: Lamotrigine and topiramate are well-known agents with their antiepileptic and mood stabilizing effects. Their therapeutic effect is associated with significant alteration of brain metabolism. 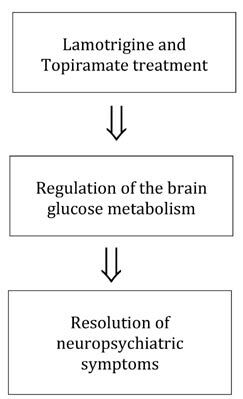 In our study, we aimed to investigate the neurometabolic correlates of the therapeutic effects of both agents in a depressive patient with anxiety symptoms and cognitive decline.